[WARNING: SPOILERS] I've mentioned this before, but Antigone by Sophocles is, like, my most favouritest Greek tragedy ever. Her almost desperate struggle, caught between institutions, laws and ideals is not only heart-wrenching, but also indicative of the awareness in Classical Athens of the disparity between the requirements of law, moral behaviour and their own religion. Although you might wonder how different this play would be if the protagonist was a man, in essence it remains desperately tragic, in, for me, the best way possible. 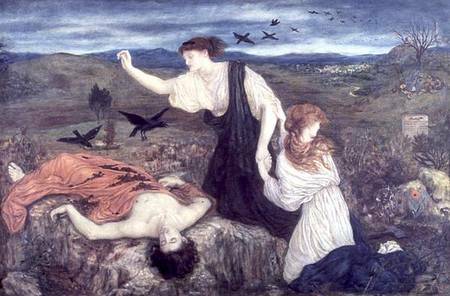 The essential plot: Antigone and Ismene are the daughters of Oedipus (the unfortunate King of Thebes). Upon his death (in the Sophoclean version), their uncle, Creon becomes king. Their two brothers, Polynieces and Eteocles, are fighting over Thebes and kill each other. (Ah, lovely tragedy). Creon allows the burial of Eteocles, but forbids the same honours for Polynieces and leaves his body to rot outside the gates of Thebes. 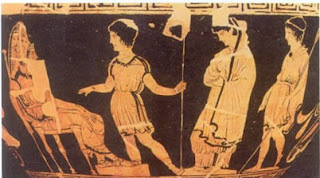 Antigone, obeying the religious law that a sister should bury her brother, sneaks out and buries him, disobeying not only her family, but also the King, the maker of laws and is punishable by death. She is caught and brought before the king. She does not beg for mercy, only for justice in the name of sisterly love. Creon sends her away to become the "bride of death" (ie be buried alive in a wedding dress), as she has transgressed the word of the law and so must be punished. Unfortunately, Creon's son was to be Antigone's husband, and begs the King to repent. Being a hardline, no-nonsense monarch, of course, he refuses, until a wandering seer warns of him of his mistake and that tragedy will befall Thebes. But too late! Antigone has hanged herself in her rock tomb, the King's son, on finding her, kills himself, and the Queen, on hearing of her son's death, kills herself. As you do. ... Summarising it like that makes it sound incredibly far-fetched. But the way the play feels, is pure heart-breaking emotion. Creon is obviously too hard on his own kin and makes the mistake of following the law to the letter. But isn't that what the law is there for? To be followed absolutely, with no exceptions, otherwise, wouldn't everyone be able to plead an exception? Creon: I will not make myself a liar to my people. He who does his duty in his own household will be found righteous in the state also. [658-660]. Antigone, above all, raises the issue of divine law versus secular law. She obeys the laws of the gods, who require that both brothers are buried with equal rites by the next of kin. So surely, in a time when divine law judged mortal law, she is not culpable? Creon has created a Catch-22 for himself by proclaiming death for anyone who interferes, only to find that it is a member of his own family. Antigone: ... That a mortal could override the unwritten and unfailing statues of heaven for their life is not of today or yesterday, but from all time, and no man knows when they were first put forth. [450-458]. To put this in context, Athenian tragedy, as a genre, was intended to question morality. It was not necessarily a reflection of real life, but was meant to pose a question, a "what would you do if ..." situation. The play itself was written c.442BC in Athens. This was the time of the 'radical democracy', when Athens was at war with Sparta, encountering the public burial of war dead﻿ and justifying the polis' democratic position, combining both the written laws of the constitution and the unwritten laws that were divine, moral or assumed. But as well as all that, to me, it really will always be a gorgeous, tragic and beautiful play.